Shear efficiency! Why waste time with dull scissors. 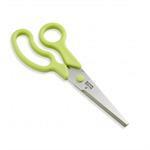 Ergonomically designed shears are easy on the hands but tough on the job. The blades come apart for easy cleaning. Use for everything - fish, chicken bones, lettuce, herbs, and more. Two precision ground blades have been combined with a nylon base and spring-loaded handle for the ultimate pizza cutting experience. 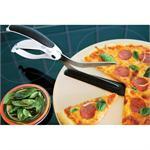 The nylon base acts as a spatula and easily slides under the pizza and protects surfaces. 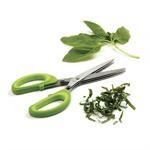 Make cutting, snipping, and mincing of herbs and scallions fast and easy with these three bladed scissors. The protective sheath doubles as a blade cleaner. Stainless steel blades with non-slip handles.